More Sketch 28 samples--sorry still not mine. One Beautiful Sample for todays sketch! Last player for Sketch 26! Welcome to the Team Billy! Tagged, Awarded and Another Sketch player too! Good Bye To You! And more sketch players too. 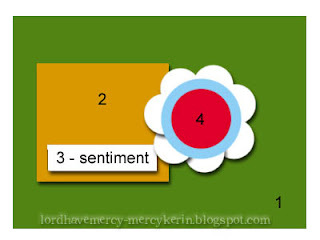 Blogger's Challenge 55 using COTW2 sketch. Food and Fun and another sketch player too. Finally! My Sketch Challenge card and one more player too! If it's not one thing it is another, lol. 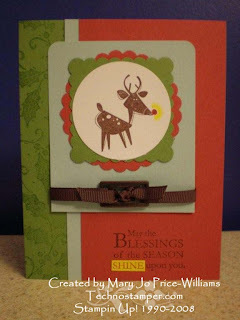 I finally got rid of that stinkin migraine and got a chance to make a card for my sketch challenge (click here to see the original post) and now the weather is yucky so I am having a hard time getting a clear picture. I hope you get the idea. I came home from camping and seen a box from Storage Units, Inks & More but could not even get myself to open it with that silly headache. So I knew that I would need to grab that box first thing when I was feeling up to heading to the studio. 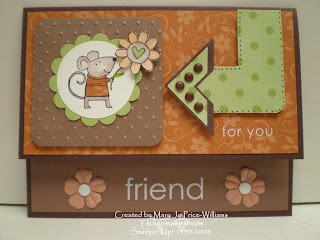 So this card is using the set Leapfrog and some new Stampin Up! colors. What a fun card, I can't wait to play some more with this set. 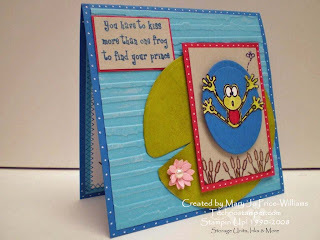 I am not sure what it is about frogs but I just love them! 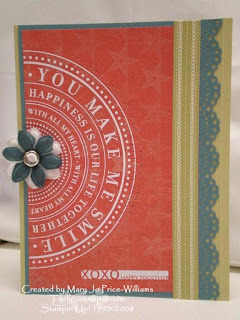 Paper: Pacific Point, Tempting Turquoise, Kiwi Kiss, Real Red, Sahara Sand, Pretty in Pink and Whisper White card stock. Other: Cuttlebug, Nestabilities, white gel pen, small flower punch, half pearl, blender pen, markers. Alright I think I am on the last leg of my migraine! I am up, walking around and feeling pretty good -- still have a headache but not a migraine. 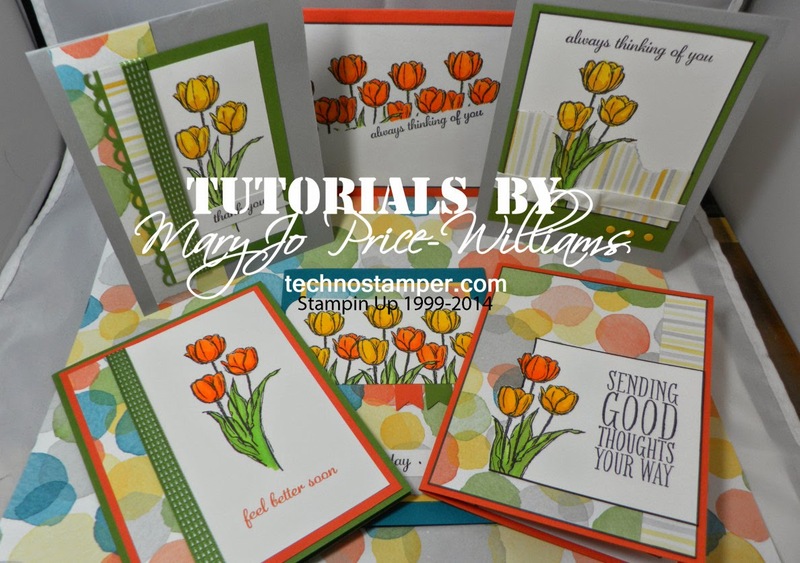 I am keeping my fingers crossed that I can get into my studio and get some stamping done tonight. I have tons of catch up stuff to do all day so it will not be before later tonight. I do have a few more really great samples to share though so please check them out! Hmm, seems that I have my work cut out for me with this sketch -- you ladies have done a super job, thanks so much. I am feeling a wee bit better so I am hoping to get a sample or two done for you before the end of the day but for now I do have one (yes, only one) sample to share from the weekly players. This is convention and vacation weeks so maybe that is where everyone else is. I hope it is due to something fun and not sick like me, lol. For those of you who have been following this I will bet you can guess who my sole player is....she has not missed one week yet and that is even better than me since I am late on this week myself and I created the sketch. Lisa you rock! Thanks Lisa, you card is beautiful as usual. I can not tell you how long it took me to do the last post. I am gonna post the sketch and come back later with the samples -- this medicine has to work some time, I hope. I am miss spelling every word so if there are lots of typos I am so sorry. Here is the sketch -- so late. I would love to have you play along. If you do please leave a comment so we can all see it. Thanks and I will be back soon - hopefully migraine free! So camping was a riot. Although we got really wet and really muddy. Unfortunately I have had a migraine since returning and that is why I am so far behind on this. I have been taking all sorts of things but so far only slight relief. This is not an easy task with a migraine but I will do my best. Great job as usual ladies! Sorry it took me so long to get to them. 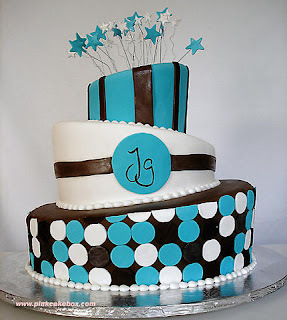 How fun is this cake. 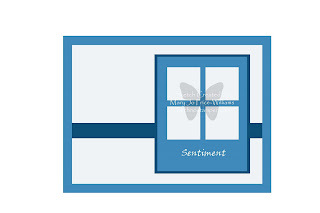 It was used for a challenge on one of my groups we had to use it for inspiration for a card and send it to our partner. Here is my card, I sure hope she liked it. I will fill in the details after returning from camping, if I remember, lol! Ok so I cheated this week. I am so far behind on getting packed ( this is being typed on Tues. Night) for camping and had forgot that I needed to make a card for today's challenge. So I picked one that I made previously. I really liked this card when I made it so I figure why not showcase it today! This weeks Challenge is Christmas in July. The colors are Wild Wasabi, Sky Blue and Ruby Red. How fun. I used chocolate chip ribbon to bring in the brown from the deer. The saying is stamped in Chocolate Chip with one word re-stamped and cut out on YoYo Yellow. Supplies used: Star Studded Season, Moose You and retired holly wheel. 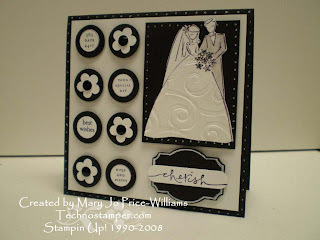 Scallop square punch, scallop circle punch, circle punch, markers, hodgepodge hardware and chocolate chip ribbon. I don't have too much time to type up too many details today but here is the supplies. 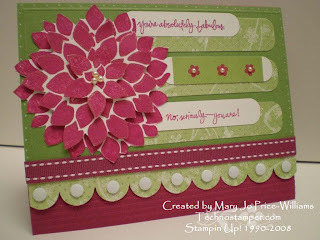 This card uses the brand new in color Pink Pirouette and the new a piece of the new Bella Rose dp. 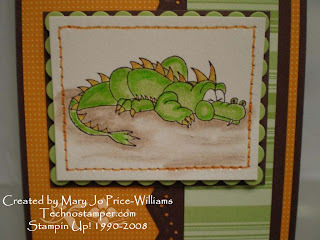 Here is another card for this weeks sketch challenge you can find the original post here. This card was just a bit frustrating for me. It was one of those days, I just got this set and every single image is one of those images that you really have to prepare before you get a good stamped image. You know with the eraser on the rubber and many other things too. I about through the whole set and the card right out the window, but now I kind of like it. I had this idea in my head but it was with more blue - green colors. I seen these scraps in my pile and changed direction completely -- color wise anyway. What do you think? Here are a few more great samples with this weeks sketch. I have one more for you too but it will post tomorrow (I hope, I am scheduling it since I will be gone). 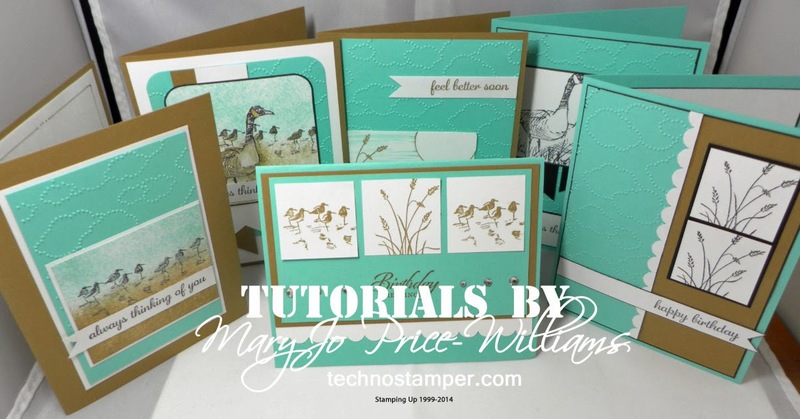 Take a few minutes to check out these samples and then why not make one yourself. I will be back on Saturday night so I will post any samples on Sunday. This flower from Fabulous Flowers is just perfect for this technique. I also used the brand new in-color Baja Breeze card stock. I love how this turned out it is just stunning in real life. My post will be few and far between for the next few days. I am leaving on Wed. morning to take my little guy camping with the cub scouts. We had so much fun last year that we can hardly wait. I do have a few things I am gonna try to schedule if I have time. I have to get packed first. Hope you have a wonderful day. Thanks for stopping by. Thanks ladies. I love all of them. I will try to make my other samples later today. Moving right along to this week's sketch. I really like this weeks sketch. I have lots of ideas in my head but I need to find a little time to put them to paper! I was a bit behind on a few other things so I had to do that all day today. I did get one sample done for the sketch and I hope to have a few more for you tomorrow. Here is the sketch. And here is my Simple Grunge Card. I just love this set with the grunge look! I am not sure if you can tell from the picture but the base layer is Close To Cocoa -- it is not that noticeable in the picture. This was a fast and easy card. Got to love those right? Other: Rub on, cuttle bug, brads, stamping sponges. Don't forget to stop by tomorrow - around 11:30 est to see the other players. I need to post a little early. Please do play along, I would love to see what you create. If you make a card with the sketch post a link in the comments or send it to me in an e-mail so I can link it here. If you post on SCS please use the keyword TSSC27. I am off to bed -- not feeling too hot, again! Ariane, what does that say in English? It sounds interesting. 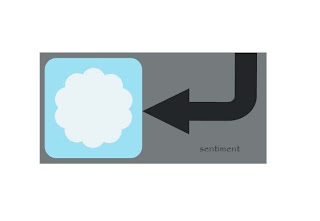 Great sample thanks so much for playing along. Time for another Mystery Image Challenge card. If you recall from my previous posts about these challenges the host of the challenge send out images of her choice to all of us that sign up to play then we are assigned partners and have to create a card with the image for our partner. 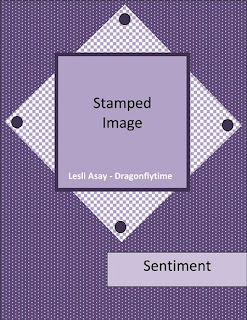 I have so much fun with this -- you never know what kind of images you will get and I don't have many of the newer company stamps -- yet, lol! Our hostess for this round was Rose and she was kind enough to send us five of the same stamped images. So after cutting them all up this is what I came up with. I am not really sure if I am happy with it but I used all the images and have no choice but to send it on! I sure hope my partner likes it. I used my sketch challenge #25 layout -- you can see it HERE. I made this card for a contest on Pink Cat Studio. You see I won this set and thought I should at least join her contest since I got the set for free! The challenge was to create a "room" for Billy. 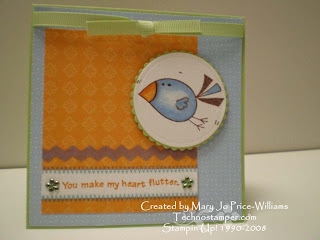 You could not use any other stamps -- only Pink Cat Studio stamps. Well I only had the one set to work from so I sat stumped for a bit. I knew I did not want to do his bedroom because I figured that was what everyone else would do (and by the way that is what won). So I tried to re-create a locker room for Billy. This set is so much fun because it is like playing with paper dolls -- that was one of my favorite things to do as a child. 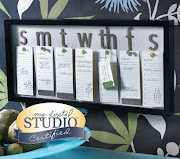 Be sure to head over to the Pink Cat Studio blog to see the incredibly creative entries. And of course the winner! I think I will start off sharing another sample for this weeks Monday Lunchtime sketch. I was afraid if I put this at the end you would miss it! As I say every time I get one of these -- I am so bad at this! I have been tagged (quite a while ago if I may add) by Brenda over at Memories by Brenda and by Kerry at Three Clover Designs. 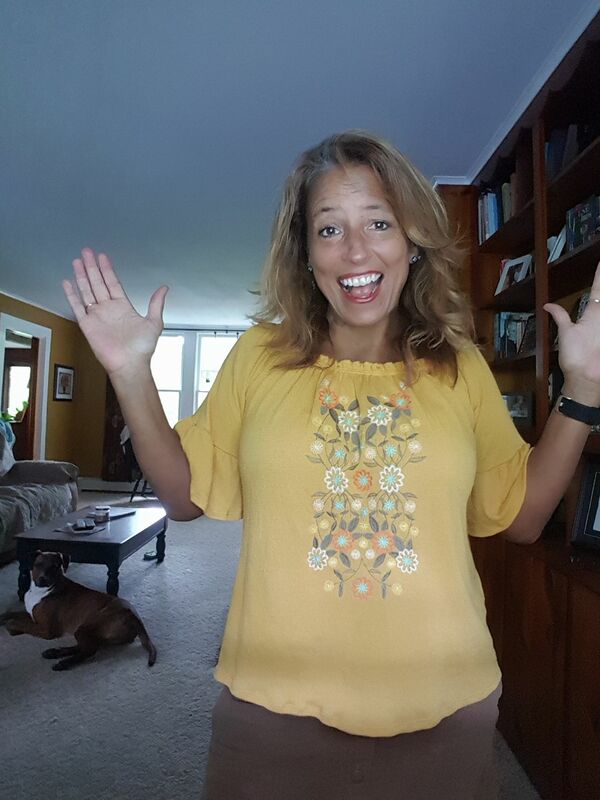 I am sure you guys have been to her blog before since she often plays along with my weekly challenges but I think you would enjoy another look at the rest of her blog too. She is quite a talented lady and she has been an inspiration to me many times. 1. I love to camp and I will be spending 4 days and 3 nights with my son and our Cub Scout pack at Camp Scouthaven this week! I remember my first time going -- I was thinking this is going to be horrible-- tent camping with mostly men and boys -- YIKES! But it was absolutely awesome. I got to spend some real quality time with my son with no computer, phone, tv or any other distractions. They do a wonderful job of keeping things running smoothly and it really was fun! I can't wait only 4 more days! 2. I sing on my praise team at my church. This is such an awesome experience. I remember when it first started I thought it was great but it did not feel like I was at church. Most of the service is contemporary praise (like the music on my blog). I remember feeling like I had to stay for the next service because as much fun as it was it didn't feel right. Well now I feel the complete opposite! I don't feel like I was able to connect with the Lord if I am at a regular service. The praise service is just that PRAISE and it is awesome! 3. I hate to wear shoes. I am almost always bare footed. Which by the way explains how rough my feet are because it is not good for the skin, lol. Of course since I live right outside of Buffalo, New York I have to wear shoes in the winter! 4. I love to eat! This is horrible and if I don't watch it I could just become as big as a house! I so miss the days when I could just eat what ever I wanted and not worry -- I almost don't even remember them they are so long ago. I can eat more than most men I know. My favorite types of food are appetizers. I don't think I ever go out to dinner without ordering at least one. 5. I am very unorganized. I would love to hear any solutions you may have for this one. I am the absolute worst. I have piles of stuff everywhere. The worst part of being unorganized is the amount of time wasted in any given week looking for things! Very frustrating but I can not seem to figure out how to get organized. If I could afford it I would pay someone to come in and just get rid of all my "stuff" and leave me with the bare essentials and a bunch of ideas of how to keep it that way. Of course I don't want that person to even know where my studio is, lol. I want ALL that "stuff" to be left alone. 6 I always wanted to have 10 kids. I only have one and he truly is wonderful -- I always tell him that he is an only child because he was my best and there was no sense trying any more. I had three miscarriages before him and was on bed rest the last few months of my pregnancy with him. He is happy that he is an only child.. he is spoiled rotten. But I fear he will not be so happy about it when he is older and has no family. I hope he marries into a big family that spend time together all the time. 7 -- Finally -- I doubt many of you are still with me this far into it but if you are I will make this one fast -- I love to sleep! I can fall a sleep anywhere. I can even get up have two or three cups of coffee and go right back to bed. I don't get much sleep due to having too full of a schedule but if I could I would nap everyday and get a full 10 hrs a night. Yea right! She is also the one who gave me the award below. The rest of the people will be people that play along in my sketch challenges that I don't know too much about -- this will help me get to know them better! 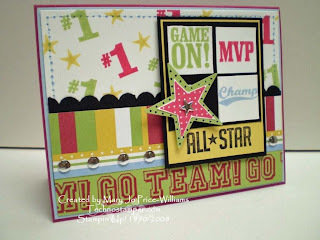 Dani has some adorable cards on her blog. She is also featured at the top of this post as the latest sketch challenge player. I am excited to learn more about you guys. Now believe it or not I have also been awarded by Wanda at My Creative Corner. That is such an appropriate name for her blog because she is so creative. I have more than once cased ideas from her. Take a minute to check her blog out. Thanks for the honor Wanda! All of these people are not only friends but wonderful artists! Get some coffee and be inspired! she has a Friday sketch challenge too! Claudia at Stamping in Columbus GA.
Kerry at Three Clove Designs. Whew! Now I know why I put this off for so long. That was way too long. 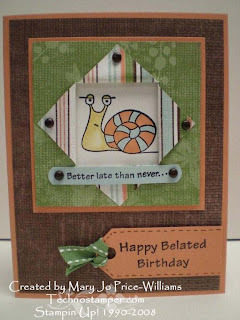 Hope you have a great day -- I am hoping to still have time left to stamp, lol. See ya tomorrow! For those who are fighting their own personal battles...whatever it may be... NEVER GIVE UP! 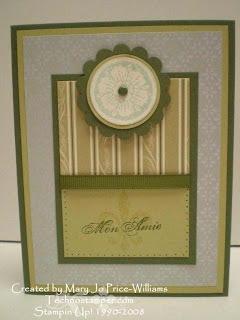 Blogger's Challenge Week 56 -- Color Challenge--Really Rust, Mellow Moss, Blue Bayou, Sahara Sand and Regal Rose-yea, that IS a lot of colors-- I can't wait to see what everyone came up with. 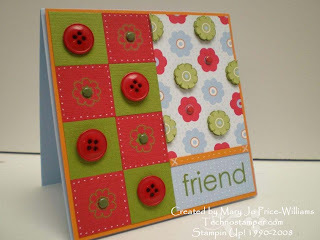 Featured Swapper on Great Swap Girls -- this weeks Featured Stamper is Arin Burdo(arinstamps) ---and this is the card I chose to case --HERE. I kept the basic layout and changed the rest. 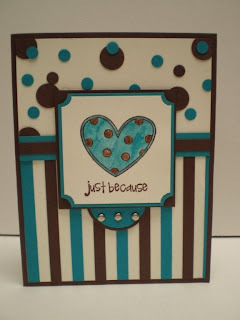 Other: Blue Bayou double stitched ribbon, brads, photo corner punch, blender pen, cuttlebug and lots of dimensionals. I also have been tagged and awarded so I will be posting that with another sketch player next. The full list will be available on July 21st and from that point on all of the accessories will be on a first come first serve basis as supply lasts. So if you want any of these you better order NOW! A great big thank you to Melissa Stout for creating this wonderful list. If you want any of these items I suggest you order before the 21 to ensure you will get them! My goodbye card to the wonderful set Carte Postale. This was a great set for both male and female cards. The papers I used are also going to be retiring because they use the In-Colors -Le Jardin. Other: Artichoke brad, scallop circle punch, Artichoke Ribbon, Artichoke marker and circle punches. Here are some more players for this weeks sketch challenge -- you can see the original post and sketch ...........HERE. 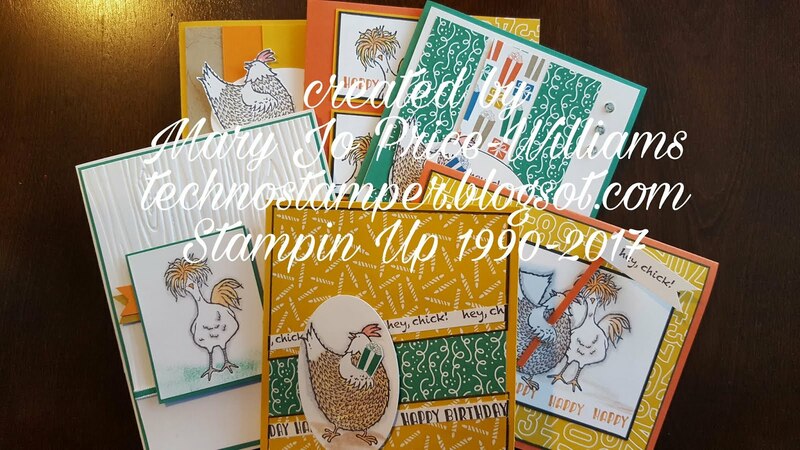 What fun cards and even a sneak peek of a new Stampin Up set! I love them all, thanks for playing ladies you did a fabulous job. Do you remember this paper from the last catalog. I found a full pack along with a full pack of the retired Cranberry Crisp and True Thyme card stock! Thought I better use it up before my pads go dry -- I never did by the re-inkers for these colors. Well that is it for tonight, I am beat. See ya tomorrow! I feel so bad, I missed these wonderful cards on the last post. I was not posting from home and was having a hard time with the other computer. Check it out! Thanks ladies they are all wonderful cards. This week is a tad more challenging that some of the other but you would never know it by looking at these samples. Can't wait to see yours. I wish I know what inspired me to do this sketch, lol. I really have a hard time with arrows and this is the second sketch I have done with them already! What's up with that?!? Ok, now for my card. 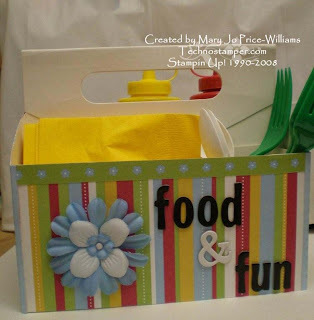 Other: Photo Corner punch, corner rounder, scallop circle punch, circle punch, rub ons, chocolate chip marker, blender pen, faux white brads, pima flowers, cuttlebug embossing folder. Don't forget to stop back around lunch time -- to see all the other players. Thanks for stopping by today. A late challenge card from me and the last sketch challenge player for this weeks sketch. The blue dp was just sitting on my table already cut to this size and already had adhesive on it. It was cut wrong for a project and I figured before the adhesive gets all covered with cat and dog hair I better do something with it. The big brads have been in my studio for quite some time just collection dust so this was a great card for me. It may be simple but it is using up lots of scraps and some supplies that have been sitting unused for WAY TOO long! The colors are Chocolate Chip, Soft Sky and Wild Wasabi. All of the players did a fabulous job this week. Thanks for playing! A wonderful RAK and a few more sketch challenge players for the week. Check out the wonderful card I received in the mail -- just because! How cool is that. I love to get totally unexpected mail. Especially when it is this beautiful! isn't that such a perfect name! 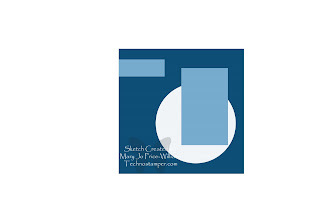 And now I also have a few more sketch player's samples to share with you! Great cards ladies, thanks so much for playing along. And here is my card for both challenges. This is another one of the clear Inkadinkado stamps that I bought at JoAnn's for $1! So Fun. All of these challenge players "make my heart flutter" check them out! Other: mini bling, rub ons, nestabilities dies, markers and blender pen. And here are the new sketch player's that make my heart flutter, lol! I really think this sketch looks harder than it really is. I hope you will give it a shot. 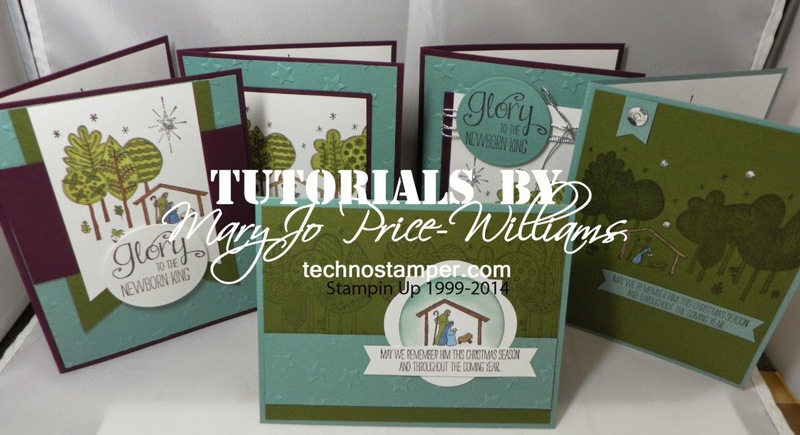 I have three wonderful samples to share in case mine did not inspire you enough -- these are great! Thanks so much ladies, you all did a wonderful job. And this is my first sample. This sample is made entirely with scraps. The Old Olive and Real Red squares are textured. The designer paper is from the just retired Summer Picnic. I also used the rub-ons from SAB. There green flowers on the dp are popped up and the red ones have red brads. You may have to enlarge to see the other details. Other: White gel pen, old olive brads, real red brads, SAB rub-ons misc red buttons. This next card is the traditional Black and White wedding card -- kinda. Each layer is popped up, including the circles. Other, 3/4 inch circle punch, 1/2 inch circle punch, designer label punch, word window punch, three for you punch, white gel pen, cuttlebug embossing folder, faux black brads, black watercolor pencil. I would love to see what you come up with. Check back around lunchtime (EST) to see the player's samples. Don't forget to leave a comment with a link if you play along. If you post to SCS please use the key words TSSC25 - no spaces. Hope there is not too many typos, I needed to get this done fast so it will post in the morning. Happy Together and another Sketch Challenge Player too. Trying to use some scraps that are laying on my work space! There are so many scraps though I will never be able to move on to new stuff if I keep doing this. And honestly, as much as I love these colors I need to move on a for a bit. This card was created without any stamps. Other: Anchored Rub ons. 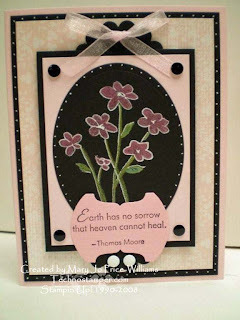 Pretties Kit and sticker strip from the Home Again Simply Scrappin Kit. 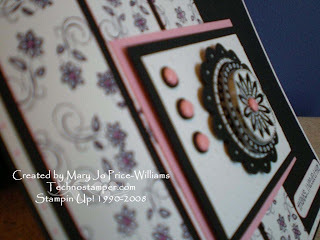 Paper piercer, scoring blade,Martha Stewart Doily Lace punch. So cute, thanks for playing Lori. Heard you've been dragon! And another sketch player. I made this card a while ago and never posted it! Isn't this the cutest dragon --if dragons could be cute, lol. I just love this set from Artful Inkables. The set is called Darling Dragons. I think I am almost over my long card trick, I really don't like trying to get a good picture of this size card -- anyone have any hints or tricks? Here is a close up of that cute little guy! Hope all my American readers enjoyed their holiday. 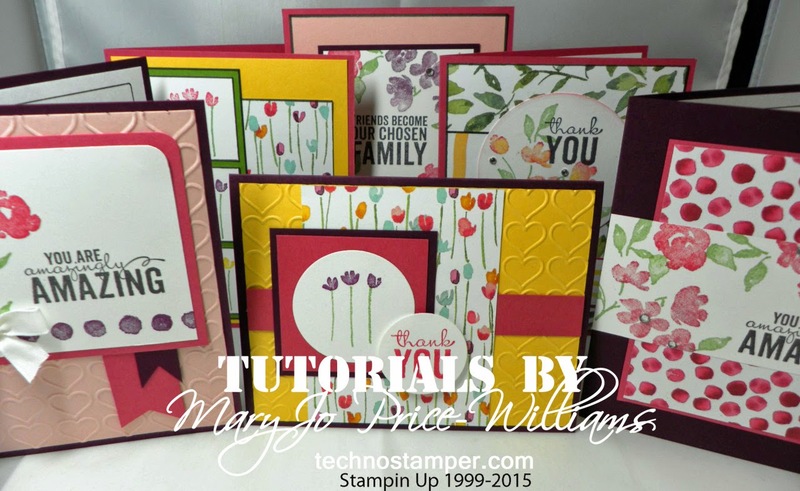 Paper: All papers are Stampin Up! 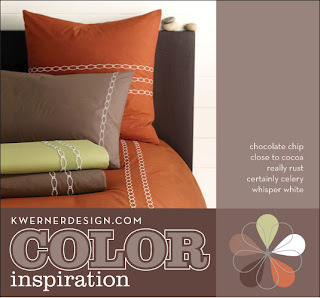 Chocolate Chip, Certainly Celery, Pumpkin Pie and Whisper White card stock. Certainly Celery Prints and Summer Picnic designer papers. 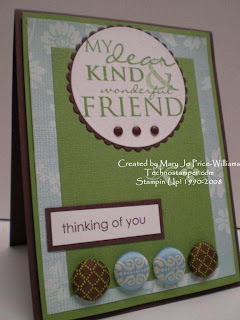 Ink: Timber Brown Stazon, Chocolate Chip Stampin Up. 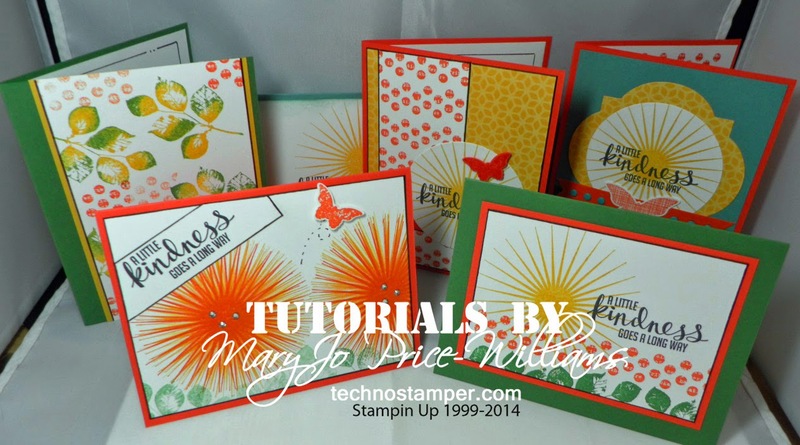 Other: Martha Stewart Emboss Zigzag Punch, Nestabilities Dies, Stampin Up! markers, watercolor pencils, blender pen, paper piercer, mat pack, brads, word window punch. And now here is another player in my sketch challenge for this week. Celebrate With Billy! Blogger's Challenge a few hours early. Fist and foremost our FREEDOM! Thanks to everyone who has or is fighting to preserve this for all of us. We are forever grateful! 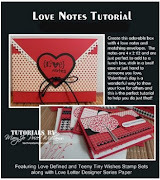 Next is FREE STAMPS -- not quite as important in the grand scheme of things but to me and my tight budget this is HUGE. 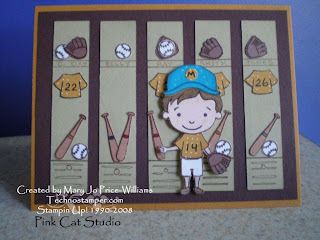 I won this wonderful set -- Dress Up Billy -- from Pink Cat Studio! How cool is that! I figured I better make time to use him so I can send a proper Thank You to Melissa. You can check out the Pink Cat Blog here -- such fun stuff! 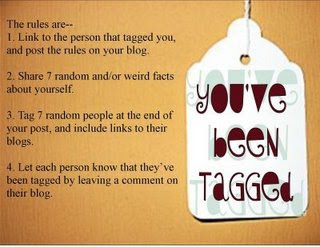 Also it is Friday (almost) so that means another Blogger's Challenge. The challenge this week was to use color blocking. I decided to combine it with the Design Team sketch challenge on the Pink Cat Studio blog -- seems appropriate, right. So without any more jibber jabber here is my card. This really was a fun card to make, I will be using this set again and again. I did a ton of paper piecing on this. 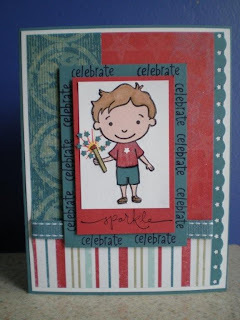 And his sparkler is created with the handle of the hammer and the little stars that were punched out of the border. 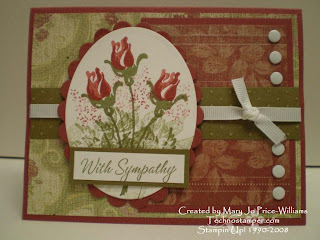 Stamps: Dress Up Billy (Pink Cat Studio), Warm Words (Stampin Up!) and The celebrate is Hero Arts -- don't know which set it was on my desk top looking lost, lol. Other: Blue Bayou double stitch ribbon and a border punch from McGill. Hope you have a wonderful 4th of July if you are in the U.S. and just a plain old ordinary GREAT day elsewhere. Thanks for stopping by today. WT173 - She Scores--the top is scored around the edges and the bottom has rows of score lines and The CC173--Purely Pomegranate, Wild Wasabi and Certainly Celery! Yippee. The edges of the flower have glitter on them and I can not get it to look good in the picture, it looks like it is not stamped solidly but it is. I am pretty happy with the results. What do you think? 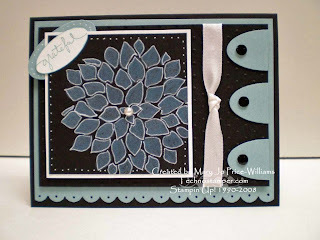 BoHo Backgrounds swap card and another sketch player. 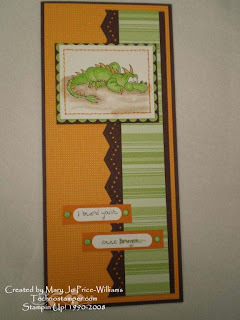 This card was created for my first swap as a Great Swap Girl. I just got my swaps back yesterday and they are all super! This one was a fun one although a bit tedious. You see I really do not like to re-create cards. Usually as soon as I make one I am done and move on to the next. 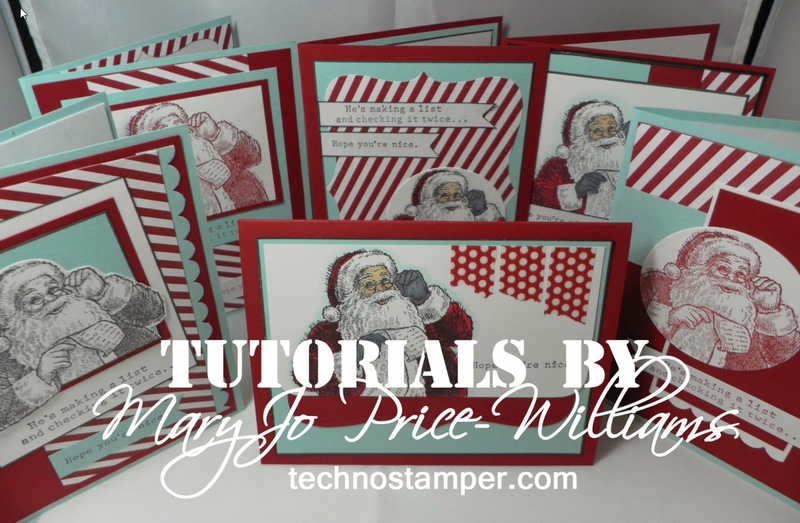 Very seldom do I make more than one of the same card -- even if I have extra supplies from a class. Hence the only swaps I join are with one of two groups. Both groups have wonderful swappers and the numbers are always kept low. For this one I had to make 15 -- which felt more like 40 to me because of all the details but it was worth it. The little flowers are stamped randomly on the three strips of paper and then I colored in the flower centers with a Rose Red marker. 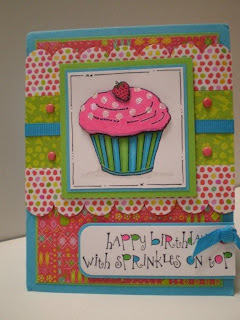 I also used that marker to add dots around the outer white layer and to add some color to the sentiment area too. 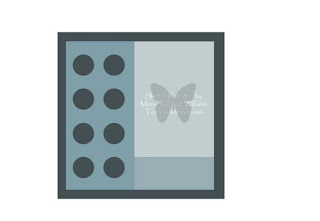 The main Black piece and the top white are both embossed with the cuttlebug. The medallion was created with three heat embossed images punched out with different size punches and popped up with dimensionals at each level before attaching to a black scallop circle. The scallop has white dots on it that were made with my gel pen. Finally I added a pretty in pink brad to the center. The three brads on the side are attached with little washer type punched out circles of black underneath them. I think the rest is pretty easy. Here are the supplies that were used. Other: Rose Red Marker, White Gel Pen, Pretty in Pink Brads, Black detail embossing powder, 1 3/8, 1 ¼ and 1 inch circle punches, paper piercer. I sure hope the girls liked them. Now for another player for this weeks sketch challenge! Great card Lori, I love that owl! Thanks for playing. Some great cards from friends and more sketch players too! Tought I would share a couple of cards I received in my mail box lately. The fist one is from Claudia Perry. 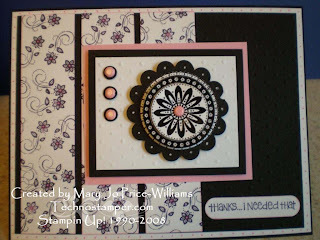 Claudia is on the Sensational Stampin Up Swappers group with me and this card was made for a sketch challenge. Didn't she do a fabulous job? 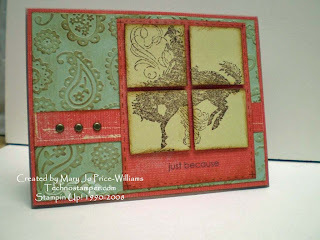 You can see her other creations over on her Stamping in Columbus GA blog. Thanks again Claudia, I love it and it is a set I do not own so great for customer samples too. This next card was for the Mystery Image Challenge on another one of my groups. Leigh O'Brien made this one and it is awesome. I am not sure you can see all the details on it. 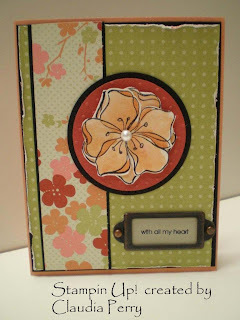 You can see more of Leigh's beautiful creations on her Sunflower Studio Blog. Thanks so much ladies, I love them both! Thanks so much for playing ladies, the cards are wonderful! This was a simple fun project. I did not want to add to many details because I really want it to be usable. This six pack holders came from Our Daily Bread Designs. I don't know about you but I will order just about anything extra to get me to free shipping, lol. I had no idea what I was going to do with these. Then as I was reading a magazine I about eating outside I thought of this. It is perfect. 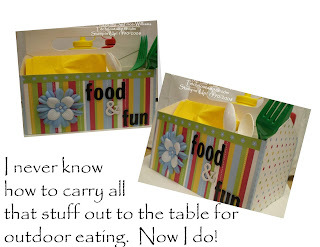 It holds Ketchup, Mustard, salt and peper, napkins and silver/plastic ware! I love it and it really was a pretty easy project. Ink: Bashful Blue to dye flowers. Other: misc chipboard letters, stickers from Crew Kids Boy simply scrappin kit, flowers from the pretties kit and a white brad. Not only cute but useful too! Yippee. Now for another wonderful card for this weeks sketch. Thanks Stacy, a great card for this weekend.